Myanmar had been closed for a long time and just made a reform very recently. This is why the country remains one of the poorest countries in the world. However, the land of golden temples still retains many traditional cultural values. Thingyan, the festival celebrating New Year in Myanmar, also known as the Water festival, is an event that has an extremely important significance in the lively Buddhist culture of Burma. Myanmar has been nicknamed the “country of the Golden Temples", with more than 90% of Buddhists in its population. Up to now, Buddhism has been regarded as the state religion (but not officially recognized by the Constitution) and profoundly influenced all aspects of economic, social, cultural, educational and national life. Thus, the major Myanmar festivals are always associated with Buddhism. Despite the fact that the Thingyan Festival is purely secular and not featured in Buddhist scriptures, Myanmar people continue to celebrate this festival integrating with Buddhist rituals. Since ancient times, the Water Festival is very popular in folklore and every aristocrat is involved in the festival. On New Year's Day, everyone prepares lotions made from flowers and different leaves in a bowl and put the bowl in font of their house throughout the festival. Each day corresponds to a different dish with another type of leaves. According to the Burmese, pink apple leaves are the symbol of good fortune and peace that will bring blessings and fortune to watered people. Today, people use tap water spray. Visitors are sprayed from head to toe. With this practice, it is said that all sadness, misfortune and dirt of the old year will be driven out and the New Year will begin well thanks to the purity of body and spirit. The Thingyan festival often takes place annually in the second week of April and lasts only three or four days. 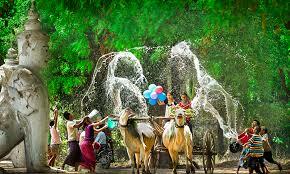 Yet the people of Myanmar all over the country enjoy the joy of throwing water on the others throughout the festival. State officials rarely join the festival. They take advantage of these consecutive days off to participate in spiritual activities in temples. During the days of the festival, many Buddhist followers go to places of worship to meditate. Old, young, men and women are together in temples. The Buddhists also have a great tradition of the New Year's Day that young people must visit the grandparents. It is an occasion to wish each other a happy new year. Adults can give advice to small children. They also exchange gifts and blessings. The date and time to open the festival are carefully calculated by astrologers. The legend says that Gods also descend on the Earth to attend the festival. In Myanmar, adults always encourage children and grandchildren to do good deeds and make religious offerings to be inscribed their name on gold leaves. In particular, they often invite monks to go to their home for spiritual practices. With this in mind, the people of Myanmar welcome the New Year in the joy and spirit of Buddhism. Nowadays, if you make a Myanmar travel during the period of Thingyan Festival, you can see that in the streets there are not only locals but also many foreign tourists participating in this practice. Thingyan is no longer a national holiday for only the Burmese but becomes an international festival. Facing economic globalization, Burma is obliged to open its doors which were closed for a long time in order to create more opportunities for the development of the country. However, Burma tourism is developing in an attempt to preserve the traditional cultural values of the nation. In this spirit, the festival of Thingyan always remains a great pride of Burmese culture.